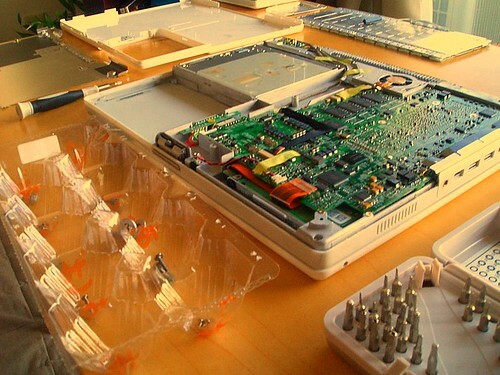 Over a year ago, T’s iBook gasped its last breaths. The hard disc drive had died. I guess it happens every few years to every computer. It had never happened to either of us. But it was all good since she just went out and bought a beautiful Macbook. The dead iBook had served us well, functioning as our DVD player, stereo system, as well as the usual computer functions, during our time in England. We had worked it pretty hard for three years. Last week I dug it out of its grave and gave it a brain transplant. A much bigger brain than it had before. I was surprised at how big and cheap memory has become. It had 40 gigabytes of memory before. Now it’s got 120 gigs, twice as much as my own iBook. Even 120 gigs is now modest. New computers now come in tetrabyes. But I don’t think it will get much bigger. The trend seems to be to have all of your music, photos and documents, as well as the applications to use them, in cyberspace. For instance, you can have all your photos on flickr, and then edit them online. Apple’s newest laptop, the Macbook Air, doesn’t even have a dvd drive, anticipating this trend. Soon computers will just get you online, and all your files and applications will be accessible from any terminal. So I’ve never done iSurgery before. I hunted down some good instructions on the internet, lured my inner-geek out of hiding, and bought the hard disc drive and some tools that seemed to be designed for dismantling bombs. I got all the supplies from Akihabara, which is the area of Tokyo packed with tech stores. It’s probably the only area of Tokyo that is completely devoid of beautiful stylish women. In fact, I only saw three women there that afternoon. If you’re more comfortable around wires, switches and motherboards than you are around women, Akihabara is where you want to go. I love tools and electronics. But like Las Vegas it’s good up to a point and then it’s too much; you have to go back to reality. And it’s only like Vegas, except that there’s no gambling, alcohol, and the aforementioned women. Most of it was pretty easy, if you’re ultra careful and organized, except for two steps. Removing the outer case was like prying a glass of cognac from Kim Jong Il’s hand. And unplugging the audio thingy from the motherboard socket was like doing a spleen transplant on a hummingbird. But it’s done and I saved one computer from the landfill and made one friend very happy to be upgrading from her 10 year old Windows NT, converting one more person to the beautiful happy world of Macs. Good job! My Ibook is still breathing but I can’t call it a laptop anymore as it just shuts down after being unplugged for more than… 5mn! But it gives me the perfect excuse to invest in the Macbook air!! thanks for the kind words, amanea! we’re all amateurs here in the blogosphere. but that’s why it’s so cool. / I am ainddg this RSS to my email and can look out for much more of your respective interesting content.